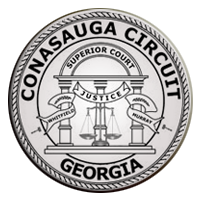 The Conasauga Judicial Circuit is comprised of two counties: Murray (County Seat: Chatsworth) and Whitfield (County Seat: Dalton). These counties are located in Northwest Georgia and have a combined population of over 100,000. Four judges preside in the circuit and each is elected to a four year term. They preside over jury trials, rule on evidence, hear motions and render verdicts in bench trials in each county. The Court also provides a variety of programs which are managed by the Court Administrator. The Master Calendars are in Adobe PDF format. You must have the Adobe Acrobat Reader installed on your computer to view this file. If you do not have the Reader, you may download it for free here.